Research & Education Association, 9780738612133, 272pp. 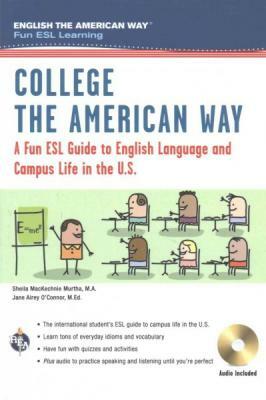 From the authors of the REA best-sellers, English the American Way and Celebrate the American Way, comes the third book in the series, College the American Way: A Fun ESL Guide to English Language and Campus Life in the U.S.
College the American Way answers the who? what? where? why? and how? questions about college life in the U.S. Learn who can help, what to do, where to go, why to check out housing and meal plans, and how to . . . HAVE FUN Each easy-to-read part is full of vocabulary, informal language, idioms, phrasal verbs, dialogues, and activities. Our audio lets you practice speaking English like an American until you're perfect Improve your listening and speaking skills with the sample dialogues included on our audio CD. You can also download the MP3 files to your mobile device and practice wherever you go. Don't miss the first two books in the series: English the American Way: A Fun ESL Guide to Language and Culture in the U.S. and Celebrate the American Way: A Fun ESL Guide to English Language and Culture in the U.S.
Sheila and Jane have been colleagues and friends for... well, let's just say a long time. As ESL (English as a Second Language) teachers, they have worked together on tons of projects and they always had lots of fun as they worked. A partnership was born! Together, Jane and Sheila have teaching credentials in several states and on two continents. With years of experience, they have taught ESL to little kids, big kids, university students, adult workers, corporate executives, and other teachers in the U.S. and Europe (online and in regular classroom settings). Sheila and Jane have served on the New Jersey Department of Education Advisory Committee for ESL/Bilingual Education. They've facilitated online ESL training courses for educators through the NJ DOE professional development program. Sheila has held several leadership positions scoring English teacher candidate responses for an international testing company, and Jane has written ESL test questions and rated English as a Foreign Language exams for another internationally recognized testing company. They have been recognized for excellence in teaching, and have won several awards, including three Teacher-of-the-Year awards, and corporate citations for excellence. They've given numerous presentations, and they've written curricula and syllabi for diverse ESL populations. Jane is the founding Director of the ESL program at Emory College of Arts and Sciences in Atlanta, Georgia, where she has worked since 2007. She has rated ITA students at Princeton (with Sheila! ), and taught at Burlington County College and Westampton Schools. Sheila has been a Lecturer at the University of Pennsylvania English Language Program since 2007. As her family grew and moved, Sheila has always found a home in universities: rating ITA students at Princeton University (with Jane! ); and teaching at universities north and south: William Paterson University, Rutgers University, and Francis Marion University. Sheila and Jane may live several states apart, but they always find time to work together on FUN projects . . like this book!